Here we are, the last post in the Living Clean Series. Are you ready?! Cleaning our home is a bit of an obsession for me. Sad, I know. But I'd be lying if I didn't admit that I'm crazy about cleanliness, and there is no better moment than the moment you've just finished cleaning the house top to bottom and it smells heavenly and you can make yourself a tea and watch Netflix. Or, more likely in this house, Bubble Guppies. Until recently, I made a moderate attempt to be 'green' with cleaning. We do have a kid, after all. So I added Method to my cleaning arsenal, because I didn't really know any other brands. I didn't, however, remove my beloved Comet, or Windex, or Fantastic. Or my yummy smelling Pledge. Just like the whole makeup and body care stuff, I had no clue this stuff was all so bad. I was actively polluting the air in our home week after week. I won't reiterate all the reasons these cleaners are so bad for you, but this is a great article summing up the basics. Continuing on with my living clean mission, I got rid of all that stuff. All of it. And my research started. I've made a lot of changes, and cleaning my house is even more fun for me now (see how weird I am?) and I'm happy knowing that the air is no longer being filled with harmful chemicals. And, having my little one help out with chores is now totally ok! I had a cleaner for everything. Like ten different products for each type of surface that I would lug around (and waste money on). After researching lot of brands, including the safer versions, I decided that I would be most comfortable making my own cleaner. To be honest,I've never had an interest in homemade cleaners. I just prefer the smell of fake lemon to real lemon I guess? Well, my whole outlook is different now, so I went on a mission to find a good recipe for an all purpose cleaner. After trying many, I've tweaked the ingredients to my liking, and I thought I would share the recipe here. This is now what I use on everything in our house from counters to mirrors to faucets. A lot of recipes call for more vinegar, but it's too strong for me. Although, you only smell the vinegar when you first spray, and just the lemon smell lingers once its dry. Still, I decreased the vinegar just a bit. I've been using this for weeks and its the BEST! I used an old method spray bottle for it (soaked it for a bit in water with some baking soda to freshen it up) and its working perfectly. Shake it up a bit before you spray to ensure your lemon essential oil is well distributed. To clean our floors, I have been using the Reveal Mop for ages now and I love it. I ended up recycling and replacing the cleaner bottle (no amount of soaking with baking soda or vinegar could clean the chemical cleaner smell) and made my own cleaner concoction. I fill the bottle about half way with water, then I add 1/8 cup vinegar, about 10 drops of lemon essential oil, and 1/2 a teaspoon of dish soap (more on that below), and fill the rest of the way with water. Give it a gentle shake and it's ready to go. To clean sinks, toilets, and tubs, I use straight baking soda. That stuff is amazing. 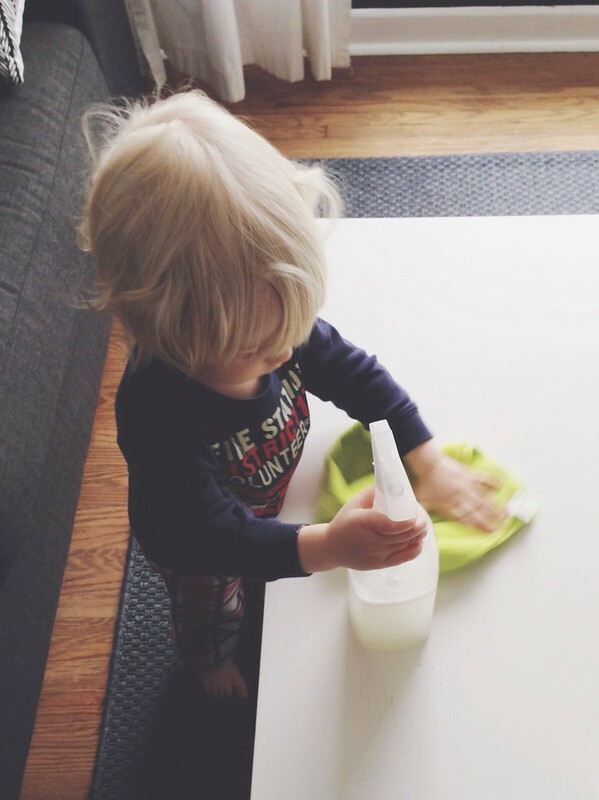 It gets rid of crayon from our coffee table, cleans label residue from surfaces (no more goo gone), and it is perfect on gross fridge handles. I've heard that it's great to clean your sink with half a lemon sprinkled with baking soda for a fresh scent, I'm going to try that soon! 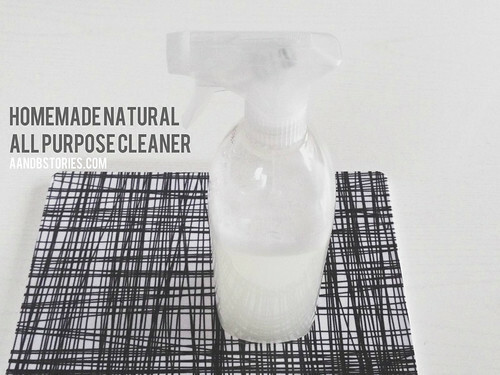 I used to make my own Febreze using water, baking soda and fabric softener, but that doesn't fit with this whole natural movement, so I'm in the process of making an all natural version. I'll definitely share once I've figured it out! Those Glade plugins are not your friend. They are loaded with chemicals that we're intentionally filling our air with 24/7! Pretty much all air 'fresheners' fall in this category...not natural at all and filled with toxins. Gross. On cleaning days, I like to have the whole house smelling fresh and yummy, and my new homemade cleaners help, but they are subtle. Then I discovered simmer pots! So, I do this weekly now to make the whole house smell great! First, as I'm cleaning I open the windows to bring some fresh air in. This is really key, especially during times when it's not warm out and the windows are shut all the time. On warmer days we can leave them open all day, but even on chilly days it's important to get a little burst of fresh air indoors. Bring this to a boil, then reduce and simmer on low for as long as you like. Make sure you don't let the pot dry out! Top it up with water as needed. (If you do happen to let it dry, as I did once - oops! - soak it for a while then scrub with baking soda. This will only work if you don't have a non-stick pot). There are many variations of simmer pot recipes (like cinnamon sticks with sliced oranges and cloves, and many others). Take a look on pinterest and you'll find tons. I grabbed a pack of microfibre clothes to try. People rave about these, and I go through a lot of paper towels when I clean. 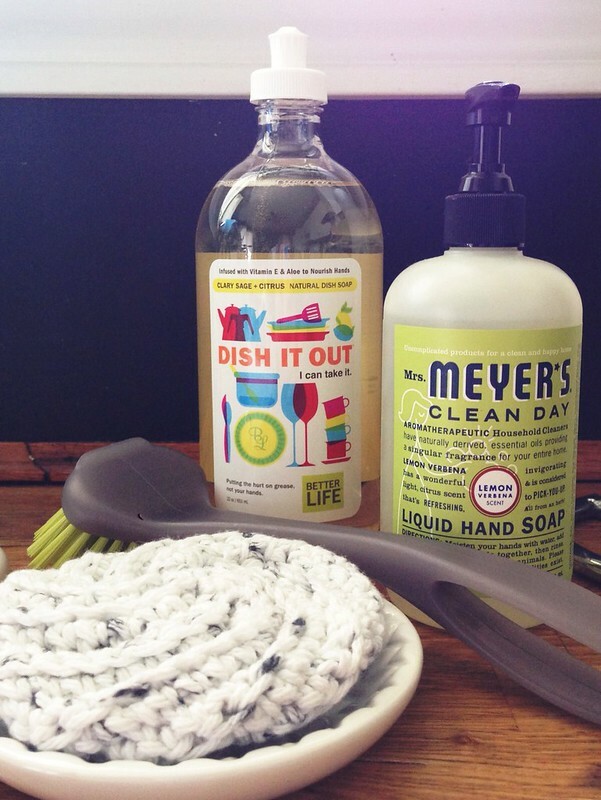 This week I tried one, and I used just one to clean my entire house! It was like MAGIC. So now I can toss it I'm the laundry and save my paper towels for special occasions (ha ha). I'm also trying in general to be more mindful of my paper towel usage, as this is a major issue environmentally. For example, after Ben is done a meal, I always wash his fave with a wash cloth. Now, after I've washed his face, I rinse the cloth and wipe his high chair and the table with the same cloth, then toss it in the laundry. Why not, right? If you use a dishwasher, take a look on EWG at the options and see what is available. Lets talk about sponges. People are always worried about the bacteria that accumulates in a sponge after you've been using it for a while...but, did you know that almost all sponges come drenched in chemicals that are made to fend off that bacteria? Um, GROSS. It's actually very hard to find sponges free of this stuff. There are some safer versions like these ones, but I decided to opt out all together. I bought crocheted cotton scrubbies on Etsy and they work perfectly! And I can just toss them in the laundry each week. Easy peasy. Both laundry detergent and dryer sheets are pretty full of chemicals, and the safer ones are pricey! Not to mention hard to find. So I decided to a) stop using dryer sheets all together and b) make my own laundry soap. Ok, I'm officially granola. There are a billion homemade laundry soap recipes on Pinterest, so take a look. I didn't want to use Borax (personally I think that's better suited for cleaning toilets and such) so I experimented with a borax free version, and this one is great! I used my food processor to grind the soap down to tiny little bits, added the washing soda and baking soda and kept blending until it was as fine as I could get it. Use 1 or 2 tablespoons of this per load. The next time I make a batch of this, I'm going to use Dr. Bronner's Lavender soap, as this seems to be a popular one to use for this. But, if it's not any different, I'll stick with the Kiss My Face because it's easier to find in stores and it's cheaper, yay! I stored mine in this old mason jar that has been lying around here for ages, that now finally has a purpose. At first I tried just tossing this in the washing machine, over my laundry, and washing in cold water. Ya, that didn't work. I try to only wash in cold water, so I came up with a solution that takes me just a minute. I put a tbsp of this in a little container with super hot water and shake it up as I'm gathering my laundry, then I just pour it in like a liquid! Note: if you like your clothes to reek of meadows, this is not for you. There really isn't much scent left behind, but your clothes are clean and free of those nasty toxins, so get over your meadows. Not using dryer sheets has been totally fine, I actually don't see a difference. Some people swear by adding a 1/4 cup of vinegar to the rinse cycle, but I just didn't bother and it was fine. Yay! I grabbed some Mrs. Meyer's hand soaps, but I'm not convinced of their safety. They seem safe, but they list fragrance as an ingredient which is an issue because any number of chemicals can be hidden behind that. According to their website they are free of phthalates, so I feel less worried...but I'm still looking for a better option. I do however adore the cute packaging. I'm a sucker. Your safest bet is really using all natural bar soaps, most of them score very well on EWG, they are cheap and they last forever. So that's the big list! There are many, many more changes I would like to make in our home and life, but I'm starting here, and I feel so excited about everything I've learned recently. I'm going to always try to be aware of this stuff, and make changes that I can in time. I may not be able to put solar panels on our house (one day?) but I can certainly switch to energy efficient bulbs and invest in a water filter pitcher instead of constantly buying bottled water. Baby steps! I am LOVING these posts!! You are making everything I've been wanting to do for some months now SO MUCH EASIER!!! I can't thank you enough!!!!! I love the pic of Ben cleaning - next time he is over here, please send him with his cleaning supplies. I've got jobs for him to do. This whole series has been a real eye-opener. You never really think about all the stuff you slather on yourself all the time. Well, now I do. I LOATHE cleaning. If only you could bottle that passion and I could buy it from you. Interesting points. It's always fascinating when we revert back to old methods of cleaning (i.e. rubbing a potato over a mirror to prevent fogging, vinegar for everything, etc.) and find such joy in it. Curious though--question to both the blogger and anyone else--do most people discover/care about toxic ingredients once they become mothers? I find that my peers who aren't parents don't care or even give a second thought to ingredients (and even if they're told they still don't really care) whereas mothers can't stop talking and posting about it. That also begs the question, why do we not care enough about ourselves to investigate these things and change habits, why does it take the thought of a child in danger to change everything? :) This blog is fabulous! 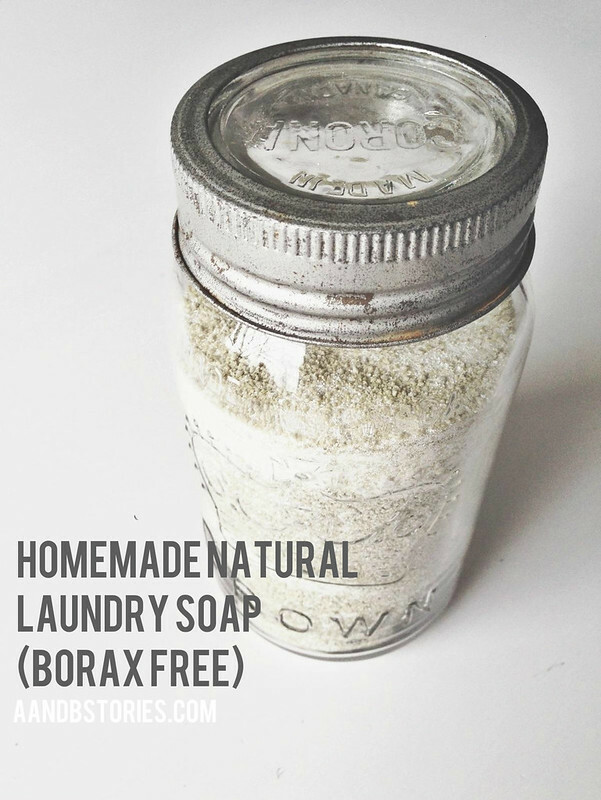 I found a link on pinterest because I was looking for a borax free laundry soap! I love that you were at the same place I am in now, wanting to make natural cleaning solutions..but haven't a clue how!! Question: Did you find any problems with grinding up soap in your food processor! ?